Go Ahead. Learn Our Rules! We understand that driver's ed is just one more thing on your running list of things to do. We get it! Keep these important policies and procedures in mind when signing up, and your entire experience will be easy and stress free. Please arrive on time! Late students will not be admitted into class, and will have to make it up in order to receive a completion certificate. We need your signature as proof of attendance for each session. Please be sure to sign in. Without a signature for each class we cannot issue credit. Missing a class is no problem! You can make it up at another date at any Next Street location. Just sign into the Student Portal and schedule your makeup. Students that have purchased Driving Lessons should book them immediately through the Student Portal, as spots fill quickly. Driving lessons must be cancelled 24 hours in advance. Less than 24 hour notice will result in a fee of $80. Any Driving Lesson scheduled for Mondays must be canceled by Saturday at noon. Students must have their Learner's Permit on them for every Driving Lesson. Students that arrive without their permit will not be able to drive and will be subject to our $80 no show fee. Open toed or open heeled shoes are not permitted. Sorry! The State of Connecticut requires all drivers to hold a Learner's Permit. We recommend that you schedule this within 2 weeks of the start of your program. Click here for paperwork checklists, a link to schedule the test online and our permit practice test. The State of Connecticut requires a form as evidence that you completed your driver's education course. You cannot test without this form! We will automatically mail your certificate 5-10 business days after you complete all purchased driving lessons and classroom sessions. 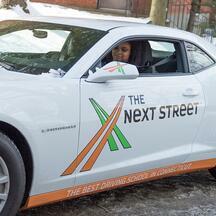 If you are taking the license test with us, we will hold onto your certificate and provide it at test time. If you need your certificate sooner, please call the office to see if it can be arranged. Overnight shipping will be a $25 fee. You should plan on scheduling your CT Driving Test for your license as soon as you obtain your permit. If you are testing at the DMV, you schedule by calling the CT DMV Call Center at 860.263.5700. 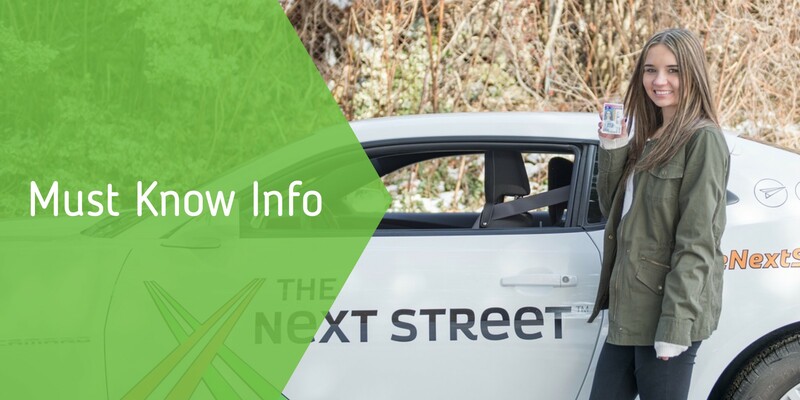 If you are testing with The Next Street, you can schedule your test through the Student Portal, or by calling our Customer Happiness Center at 800.732.8090. In the event that we deem road conditions unsafe we will post cancellation information on Twitter, Facebook and our homepage, and will always update our voicemail. For up to date weather related information, visit our Weather Center.